TheYearRounder's Guide to Provincetown: Can Anyone Identify this PTown Location? Can you identify this spot? Help me if you can. Does Anyone recognize this spot, or know the name "The Bars" as the title of this postcard reads? 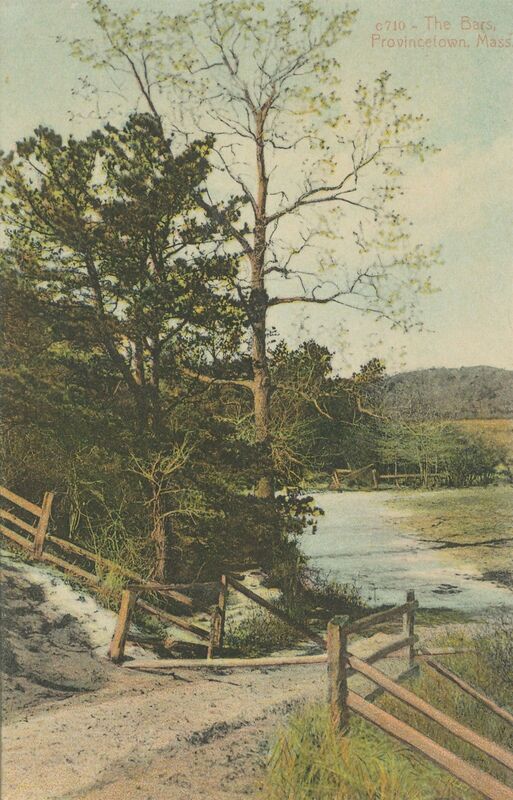 Printed a bit faintly in the upper right corner of the card is "c. 710 The Bars, Provincetown, Mass." I've never seen, nor even heard of this place, which certainly doesn't mean that it didn't exist, but I find it curious. For one thing, there aren't a lot of tree-covered hillsides around town, as seen toward the back of this view. In my vast collection of photo and postcard images of Provincetown and its history, there are a number that were incorrectly labeled by the publisher, and I'm wondering if this is another of those. That doesn't seem very likely, though, since the publisher was the Advocate, the venerable Provincetown publisher that put out the weekly town paper of the same name, and also ran what may have been the largest postcard operation on Cape Cod, publishing their own cards. Now Waydowntown, the old Advocate Building is still quite charming. There was another building, attached at the back of 265 Commercial Street, where the newspaper was printed, but most of the postcards of that era were printed in Germany, owing to the superior quality of prints achieved by the skillful Germans and their very advanced presses. The early Advocate postcards were no exception. 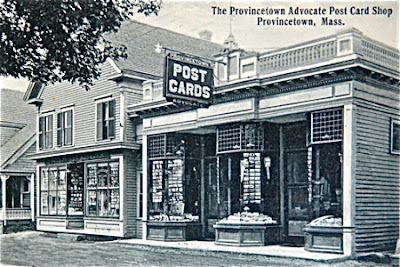 Boston architect T. M. Sargent designed the storefront with rather oversized windows to show off the cards, newspapers and souvenirs offered to a tourist trade that was already beginning its steady growth by 1911, when this shop was built in the center of town, right across the street from Town Hall. The windows above, made up of a couple of hundred tiny panes, create one of my favorite architectural details on Commercial Street. The decorative woodwork above and below the windows also helps to make this building one of the most charming in town. For a time the postcard business even seems to have spilled into the next building to the east through a "hyphen," a small addition built between two structures to join them. As it turns out, there are quite a few hyphenated buildings in Provincetown. At any rate, there's a bit of the history of The Advocate Building, as it was known. Now, back to my question… Does anyone know a spot in Provincetown called the Bars? If so, please leave a comment here, or e-mail theyearrounder@wildglobe.com, or call me at 42423PTOWN. This one has me stumped. Location:Provincetown, MA USA Somewhere in Provincetown? A loyal reader suggested that this might be on Lieutenant Island in Wellfleet. To me, the scene feels like The Cape, but not like PTown. Any other hunches?